Val Golding, who passed away in 2008, kindly allowed us to reprint excerpts from his work "SAN FRANCISCO: that was THE CITY that was." Here he shares some 1930s memories. Sunset Reflections, so the title says. But I was actually born in 1930 in the Richmond district. Construction for the 31 streetcar line was just barely under way when I was born. I lived in flats, my parents upstairs and my grandparents downstairs, at 1715-1717 Cabrillo Street. The building still exists; are they still called "flats" today? Most of my young life was spent in the Richmond and Sunset districts. Houses at 15th and 17th Avenues and Lake Street, then to 1941 Irving Street. Here we had a soda fountain known as "Timel's Creamery," a partnership between my father and stepfather. 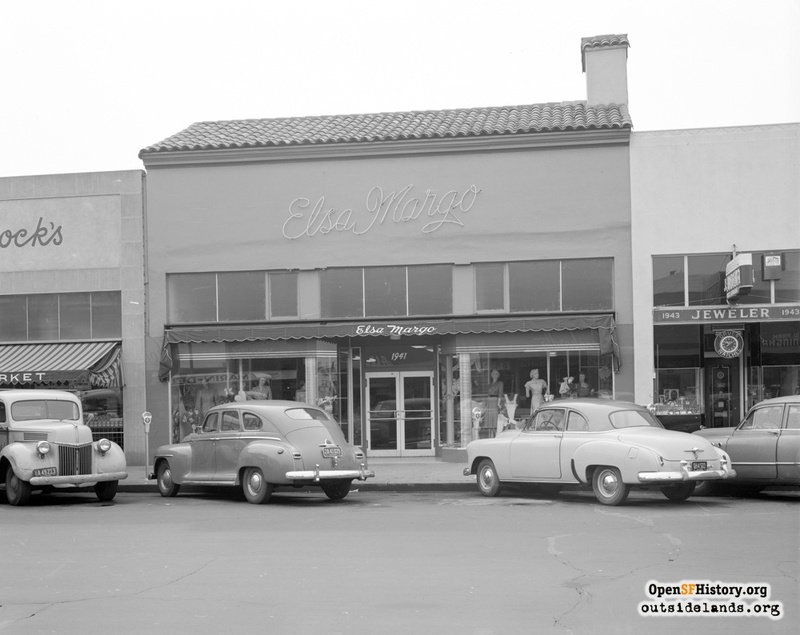 We featured "Eatmore" brand ice cream, manufactured locally somewhere on Lombard Street. My stepfather took me there occasionally and treated me to a scoop or two of what today is known as soft ice cream and dispensed from machines specifically for that purpose. Then, it was only a step to producing five-gallon containers of conventional ice cream. We used to keep about a dozen of these on hand, along with an array of syrup dispensers. As a note to those readers from a later era, my mom used to hand me a dime and ask me to go next door to the butcher shop and get a couple of lamb chops. I lived in an apartment in back or upstairs but the entrance was actually on 21st Avenue, although the address was 1941 Irving Street. Timel's was the place to be for high school kids from nearby Polytechnic High. They would come in, drop an endless stream of dimes (three plays for a quarter) in the Seeburg jukebox, and dance away the evening. My mother would often come out and dance with some of the boys and occasionally with the girls as well when the boys hadn't yet shown. Even at my age I had a crush on one cute girl, whose name has long since crumbled like papyrus into fragments of ancient memory. Since I didn't know how to dance, my hopeful romance was limited to brief conversations, mainly "hellos" and "goodbyes." After a brief sojourn at 456 Waller Street, we ended up at 3822 Kirkham in the outer Sunset, across the street from Francis Scott Key elementary school. This was my grandparents' new home, a present from my mother and stepfather who put up a down payment. I don't recall how much, but the purchase price was only $3,500. That building also stands today, a smart-looking "baby five," as it was known at that time. It sported a iron-gated patio entrance with stairs winding up to the front door. It was also the base, along with 605 Mississippi Street in later days, for almost all of my rail fan adventures. 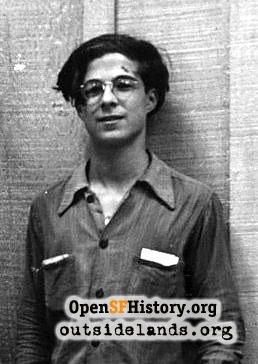 Although not yet a teenager I was precocious, and after having been taken once to Treasure Island for the World's Fair, I was soon going there on my own—by streetcar, ferryboat and Key System train. Likewise, I was developing my first and lifelong-lasting attraction to streetcars. I gallivanted all over town building a memory base of Important Things like motor and controller types for each series of streetcar. I became known to many motormen and ultimately convinced a few of them to allow me to operate their cars. I was living on Kirkham Street during the early days of World War II and I'll never forget my 11th birthday, December 8, 1941. The candles were burning brightly on my applesauce birthday cake when there came a loud knock on the door. It was a soldier who instructed us to immediately turn our lights down low and draw the blinds. I looked outside to find the street in total darkness; even the streetlights were extinguished. It was only a few days later when city crews came around to cover the western-facing portion of every street light globe with brown paint. This was to be the case just about everywhere west of Twin Peaks, the Richmond, the Sunset and the Parkside. My favorite streetcar line was the 31-Balboa and I have fond memories of summer nights, when the air was calm and still warm from the heat of day, of hearing the spur gears of the Balboa 900's GE90 motors growling their way up the cliff-like grades of the mighty Balboa Dip. In mid-1939 my excitement intensified as I spotted car 979 at 30th Avenue and Balboa Street, the very first car to be freshly painted in the Market Street Railway's new "zip stripe" or "streamstyle" paint scheme. The brilliant butter-yellow roof and trolley poles were simply stunning. I wrote previously about prowling around the streetcar graveyard at Funston and Lincoln Way, so I won't repeat myself here. But another great Sunset adventure was riding the 7-line car home along Lincoln Way late at night. Now, the 7 faced stiff competition from the "N," just two blocks away on Judah Street. The N-Judah had a considerable speed advantage over the 7 because of the almost-one-mile length of Duboce Tunnel under Buena Vista Park. Compared to the running time of the 7, the N trimmed the time to the beach by several minutes. It was therefore no great surprise that late night 7s ran mostly empty. With nearly empty cars, most 7-line motormen, after making the last full stop at 20th Avenue, would notch their controller up to full speed leaving it there until there was reason to slow down. The 7 was serviced by rickety wooden-bodied 100 series cars of the Market Street Railway with notoriously poor air brakes. So, in order for me to get off at my stop, as early as Sunset Boulevard, I'd tell the motorman "I get off at 41st," and he would immediately throw off the controller and apply the air full on. Depending on the individual car, the 7 would slide to a stop, wheels smoking, anywhere between 40th and 45th. I later moved to 605 Mississippi and still later, after my marriage, to 509 Noriega Street, high up on the Golden Gate Heights hillside. But my fondest memories remain of the early years in the Sunset where a trip through Duboce Tunnel would find bright sunshine from the east portal to downtown and thick, can't-see-your-hand-type fog from Carl and Cole Streets on out to the beach. Contribute your own stories about western neighborhoods people!